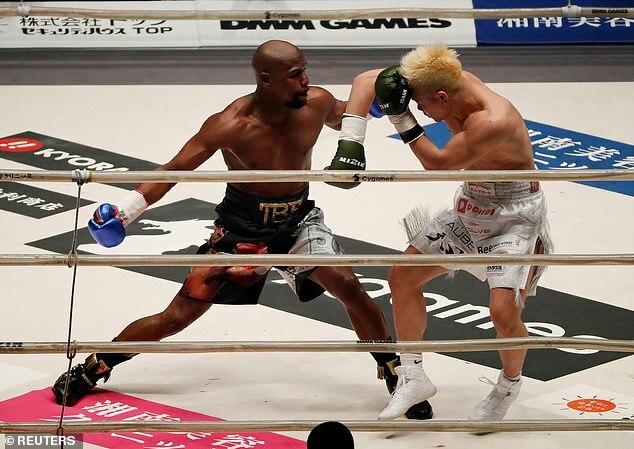 Undefeated American boxer, Floyd Mayweather has defeated his opponent, 20-year-old Japanese kickboxer Tenshin Nasukawa in an exhibition bout which took place today in Tokyo, Japan. The 41-year-old dropped his Japanese opponent three times in the opening round of what was planned for a three-round fight. Mayweather knocked him out in just two minutes to win the clash. After the fight, Mayweather who initially pulled out of the fight due to a misunderstanding between himself and the organisers which was later resolved said: ‘We are both still undefeated, I did this to entertain the fans in Japan, they wanted this to happen and I said why not, Tenshin is still a great champion, I am still retired. ‘Tenshin hold your head up high, I want the fans to support him, he’s a great guy, a great fighter and great champion. The undefeated champion who has won 50 of all his fights was reportedly paid $9M to take part in the exhibition bout.